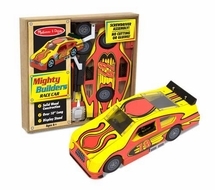 When assembled, this snazzy racer is over 10" long and packed with cool features. Your mighty builder can grab a screwdriver, and assemble this pre-painted stock car without any cutting or gluing. When complete, decorate with stickers and get ready to roll!